Our last article touched on the benefits of Pilates and how it can help you, no matter your fitness level or pre-existing conditions, achieve your fitness and life goals (if you missed it, we have great information on our website). So, with that said...Why would you call Complete Pilates & Fitness over other studios offering Pilates and Barre classes? As an independently owned business, led by Suzi Smith, who has over 14 years teaching experience (including 10 in the SCV), we focus on you, our client, and not on the bottom-line. It is not a numbers game with us...so instead pushing you to sign-up for an unlimited program, or a program with short-term expiring classes, like many other studios do, we focus on making Pilates affordable and only charging you for the classes you actually take. We run many specials and even offer trial classes with significantly reduced rates. We purposely keep our classes small and intimate (generally 3-5 people) so that we can give you the individualized attention you need and deserve. This is a completely different approach than the franchises use...as their classes are much larger and their instructors teach from the front of the room rather than moving from client to client. We can't understate the difference this makes for your workout. The entire focus of Pilates is that it protects you because it adapts so well to your individual body and needs...and that can only be achieved by actually being hands-on during your sessions! Additionally, because our studio is only used for Pilates and Barre, and not things like dance classes, we are able to be completely flexible with class times. If fact, it only takes 2 people to create at class...and we are always happy to add classes at times that best fit your schedule! You'll also see that we are constantly adding classes and new programs to our studio! Jenifer Felan, the best Barre teacher in the SCV, now teaches her Barre and Beyond class on Tuesdays, Wednesdays and Fridays! Come get the best Barre workout in the SCV! We've also added "Pilates for Dancers ages 10-21" to our studio schedule! This super affordable program increases your dancers balance, flexibility, and strength! 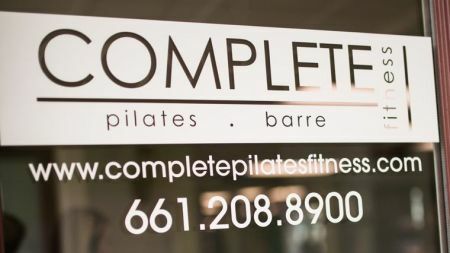 At Complete Pilates & Fitness, you'll get the workout you deserve and the results you desire!